The Washington Redskins will be looking to avenge last year’s playoff loss when they take on the Green Bay Packers at home on Sunday night. Washington is currently favored by 2.5 points in this game, and their 26.50 point implied total is the sixth highest of any team this week. That makes the Redskins a great target for fantasy points. Now let’s take a look at which Redskins players should be considered in daily fantasy football for Week 11. In Week 10, Marcus Mariota torched the Packers for 295 passing yards and four touchdowns for the second most standard fantasy points of any quarterback. It was the sixth time in nine games this season that Green Bay has given up 280 or more passing yards, and the fourth time that they have allowed three or more passing touchdowns. Cousins has only thrown more than two touchdown passes in a game once this season, but has racked up more than 280 passing yards in six of nine games. He currently sits fifth in the NFL with an average of 305.5 passing yards per game. At 13% of the salary cap on each daily fantasy site, Cousins is very fairly priced and makes for an excellent play in all formats this week. With 21 and 22 carries respectively across the past two games, Robert Kelley has claimed the top spot as the starting running back of this team. And he has fared very well, averaging 92 rushing yards per game. Meanwhile, Green Bay has struggled recently, giving up 17 or more standard fantasy points to an opposing running back in four of their past five games. They will be playing this game without their leading tackler in Jake Ryan, who hurt his ankle in Week 10. Despite his price increasing on both daily fantasy sites this week, Kelley remains one of the cheapest starting running backs. His low price, high number of carries, and the great matchup make Kelley an excellent target in all formats. With DeSean Jackson‘s status unclear at the time of writing this, we’re going to assume he’s not playing. Since DraftKings has late-swap capability, be sure to check on Jackson’s status when the Redskins inactives are announced Sunday night. With that being said, Jamison Crowder is in play regardless of Jackson’s status, but will certainly see an increase in both playing time and targets if Jackson remains sidelined. Crowder leads the team in both receiving yards (535) and touchdown receptions (5). He has eclipsed 100 receiving yards in two of the past three games, and has put up double digit standard fantasy points in each of the past four games. He has also caught three touchdown passes over that four-game span. Crowder will have a great opportunity to extend that streak against the Packers, who have given up at least one touchdown to a wide receiver in seven of nine games this season, and allowed three different receivers to catch a touchdown pass in Week 10. He has run 74% of his routes from the slot this season, and will likely see extended playing time on the right side, where Jackson typically lines up 43% of the time. That will primarily have him lined up across from Micah Hyde and Quinton Rollins, both of whom rank outside of the top 65 cornerbacks according to Pro Football Focus. There seems to be a theme here with Redskins players being underpriced this week, and count Crowder among them. Roll him out with confidence in any format. Pierre Garcon has not been nearly as consistent as Crowder, nor has he seen the same ceiling. But he has been over 65 receiving yards in three of his past four games, and caught a touchdown pass in the last game before that span. With Crowder likely lining up across from Green Bay’s softer cornerbacks, Garcon will spend much of his day dealing with Ladarius Gunter, who is Pro Football Focus’ 33rd best cornerback this season. That is still weak for a team’s top-graded cornerback, but the matchup is not as soft as Crowder’s. Compared to Crowder, Garcon is much more reliant on Jackson being out in order to see enough targets to return fantasy value. This uncertainty takes him out of consideration for cash games, and his price on FanDuel is a little high to play him in tournaments there. Garcon is in play in tournaments over on DraftKings, where he costs only 8% of the total salary cap and gets a boost from the point per reception (PPR) format. 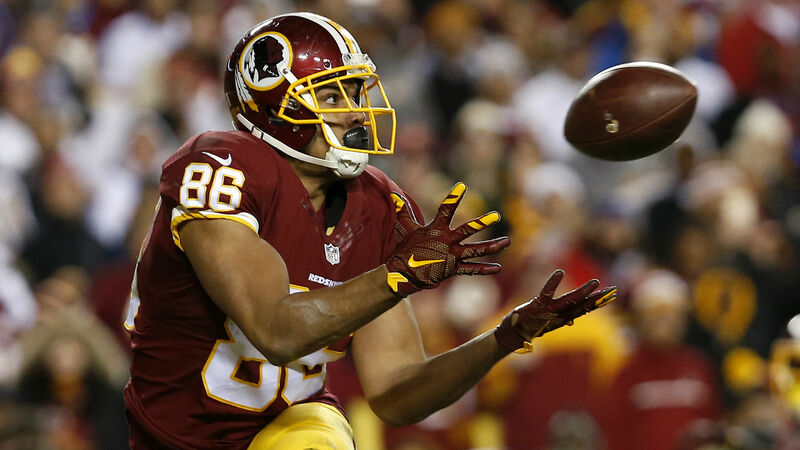 When healthy, Jordan Reed is among the top tight ends in the NFL. He leads all tight ends this season with 9.0 targets and 6.3 receptions per game, while sitting fourth with 65.1 receiving yards. He is also tied for the team-lead with 44 receptions, and is second with three touchdown catches despite missing two games already this year. Delanie Walker carved up the Packers defense with nine receptions for 124 yards and a touchdown in Week 10. That made him the sixth tight end this season to catch four or more passes against Green Bay, which shows they can be exposed by the position. With Rob Gronkowski likely out this week, Reed is the top tight end on the board, and is in play in all formats. Even with Reed back the past two games, Davis averaged 79.5 yards per game, and has shown that he was not just a fill-in for the starting tight end. However, at least 47% of his yardage in each of those two games came from one long pass. This makes him very reliant on catching a deep ball or touchdown pass in order to return any fantasy value. The Packers actually did give up a touchdown pass to two separate tight ends in Week 10, so we can’t rule that out as a possibility here, but it is unlikely. At 8% of the total salary on FanDuel, I would stay away from Davis. But at only 6% of salary on DraftKings, he is a long-shot tournament play for anyone looking to spend up elsewhere in their lineup. Washington’s defense has held four of their past five opponents to 20 points or less, and has averaged an incredible 3.4 sacks per game over that span. They have also came away with an interception in each of their past two games, and added a fumble recovery in Week 9 as well. As well as Redskins have looked recently, the Packers have looked equally as bad at preventing opposing defenses from racking up fantasy points. Green Bay has given up double digit fantasy points to four of the past five defenses they have faced. Despite scoring 25 points or more in four of those five contests, they have struggled with both turnovers and sacks. The Packers have given up 11 total sacks over their past three games, and rank 12th in the league this season with 14 giveaways. With the opportunity to rack up fantasy points regardless of how many real points the defense allows, Washington is an excellent play in all formats. Dustin Hopkins has been excellent from a fantasy perspective this season, with double-digit FanDuel points in six of nine games. On the flip side, Green Bay has allowed double-digit fantasy points to opposing kickers in six of their own nine games this year. Playing at home on a favored team with a high implied total bodes very well for a kicker, which adds to a great matchup for Hopkins here. His safe floor as well as a high ceiling make him a great play in both cash games and tournaments on FanDuel, despite being the sixth most expensive player at his position.